A typical example of a Georgian Conservatory Design. 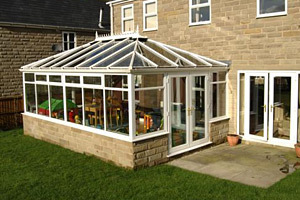 The Georgian style of self build conservatory is also often referred to as the hipped back Edwardian. The Georgian width is always significantly more than it's projection, while technically the hipped back Edwardian should be called the reverse drop Edwardian and have it's projection more than it's width. The Georgian roof has four pitched elevations and is supported on the host wall by a structural aluminium box gutter. The DIY Georgian style conservatory is the only model, bar the lean-to where the width has no limit and the projection can be up to around 5.2m. Keep in mind mind when designing a large Georgian style conservatory that planning permission is required if the structure projects more than three metres on a semi-detached or terraced property, and four meters on a detached house. Other regulations to bare in mind is if the internal floor area exceeds 30m2 or the external volume is more than 70m3 building regulations will be enforced. Once building regulations are enforced you need to comply with rules such as minimum foundation depths, structural support of the conservatory and insulation values in the floor, walls and composite conservatory structure, this includes wall and roof glazing.